Product prices and availability are accurate as of 2019-04-12 22:28:56 EDT and are subject to change. Any price and availability information displayed on http://www.amazon.com/ at the time of purchase will apply to the purchase of this product. Cool it down. Keep air moving up to 11,200 cfm in larger shops, garages or warehouses with the q standard 36" direct-drive drum fan. 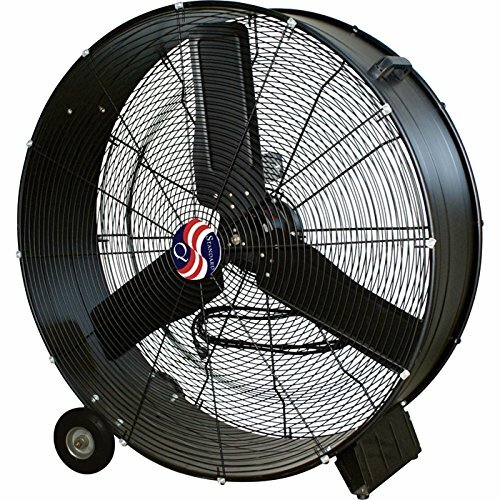 You'll get years of dependable service and quiet running from the 2-speed, 3/5-hp motor and balanced blades. Rugged direct drive 3/5-hp steel enclosed motor with sealed bearings, 2-speed motor for versatility, moves air up to 11,200 cfm, requires less power to operate and needs less maintenance, 3 non-corroding, aerodynamically balanced blades prevent walking/creeping and maximize quietness, heavy-duty steel construction, handle, wheels and 10' cord for simple mobility, material: Steel, fan diameter: 36", air flow/delivery: 9,100 cfm (low) / 11,200 cfm (high), motor: Air over, horsepower: 3/5, amps: 3 (low) / 3.5 (high), volts: 120, watts: 360 (low) / 405 (high), blades: 3, speeds: 2, speed: 950 rpm (low) / 1100 rpm (high), decibel rating: 68, needs to be hardwired: No, wheels: No-flat rubber, cord: 10'L. Dimensions: 39.5" x 13" x 39"h, weight: 67 lbs.